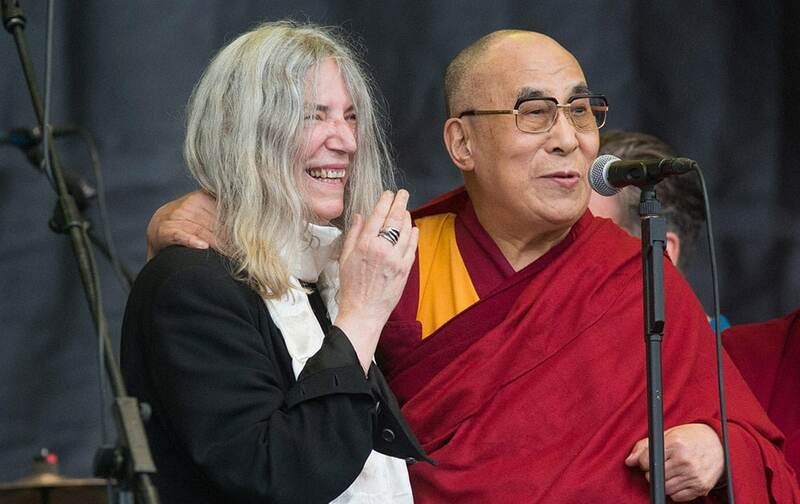 The Dalai Lama speaks to the crowd during singer Patti Smiths, left, performance at the Glastonbury music festival in Glastonbury. 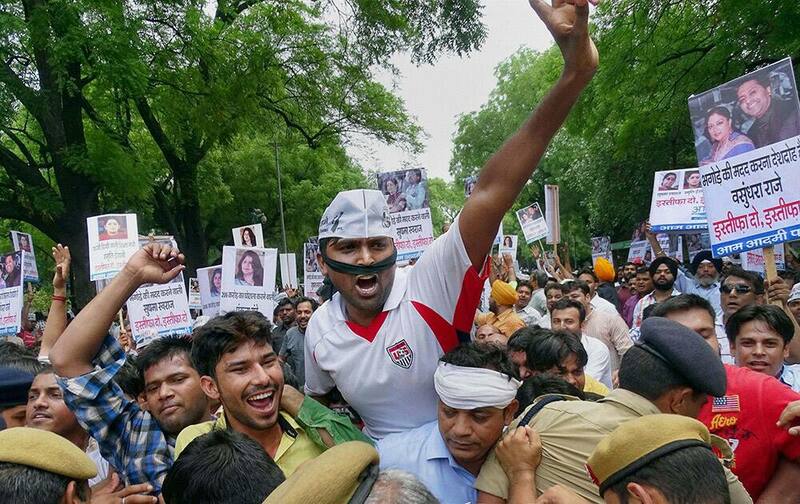 Workers of AAP holding a protest to demand the resignation of the Union Ministers Smriti Irani and Sushma Swaraj and Rajasthan CM Vasundhra Raje and Pankaja Munde in New Delhi. 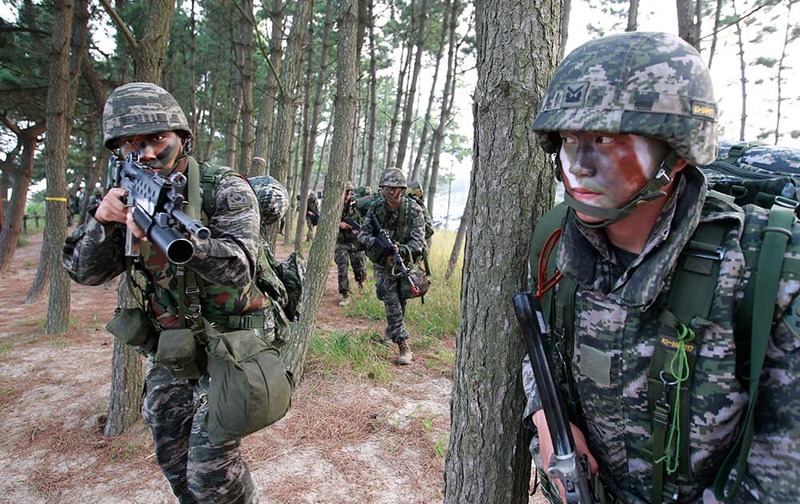 South Korean Marines move after they landed on the beach during a landing exercise in Taean, western South Korea. 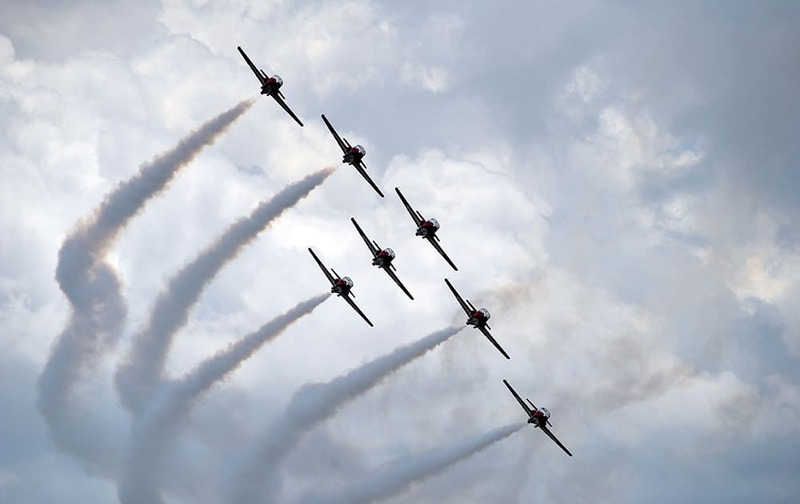 The Canadian Forces Snowbirds demonstration team flies in formation over the Ohio River during the ShrinersFest air show, in Evansville, Ind. 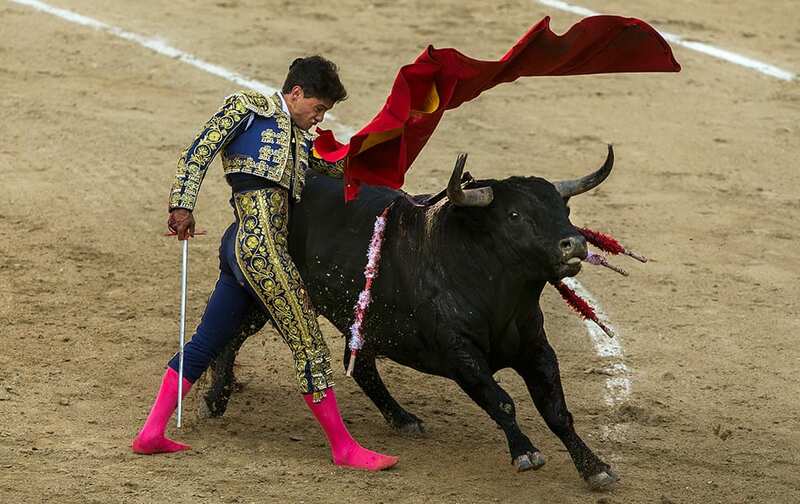 Bullfighter Alberto Escudero performs barefoot after he was tossed by the fighting bull during a bullfight at Las Ventas bullring in Madrid, Spain. 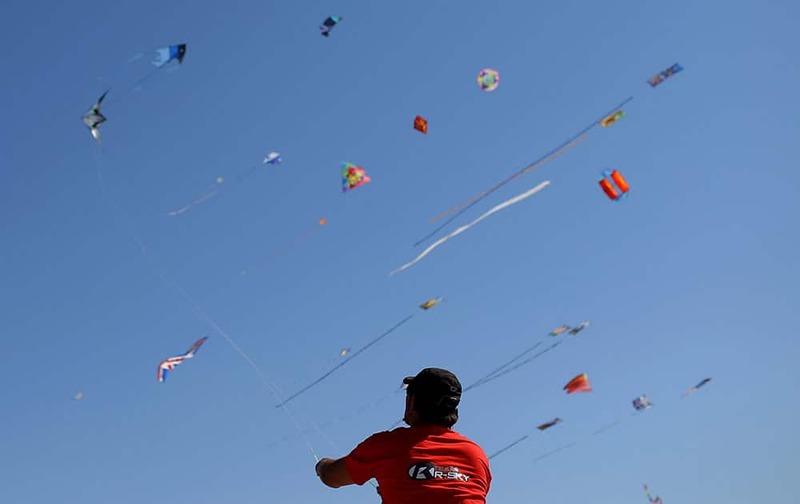 A member of a French team performs during an international kite festival in Alcochete, near Lisbon, Portugal. 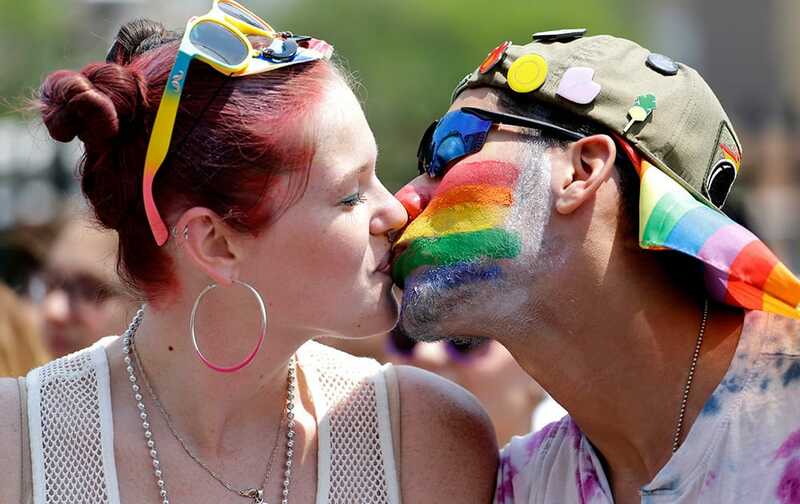 Andrew Parker, right, kisses Stacy Washack as they celebrate during the 46th Annual Chicago Pride Parade, in Chicago. 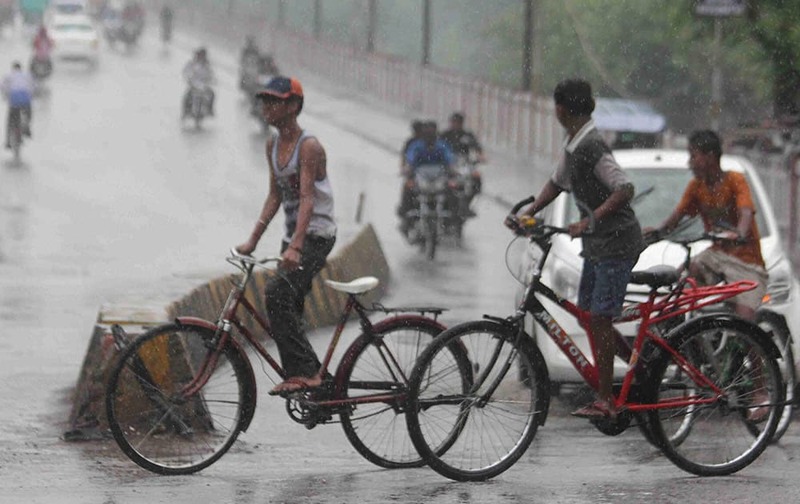 People commuting on road during heavy rains in Allahabad. 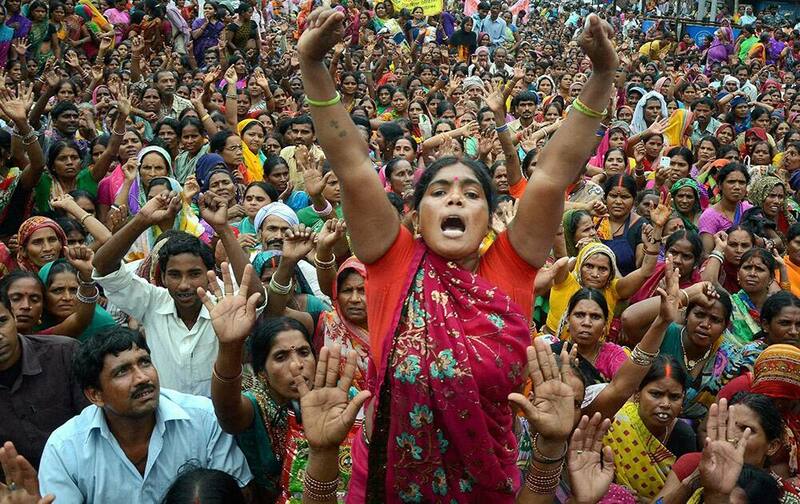 Mid Day meal cooks protest to demand permamnent jobs in Patna. 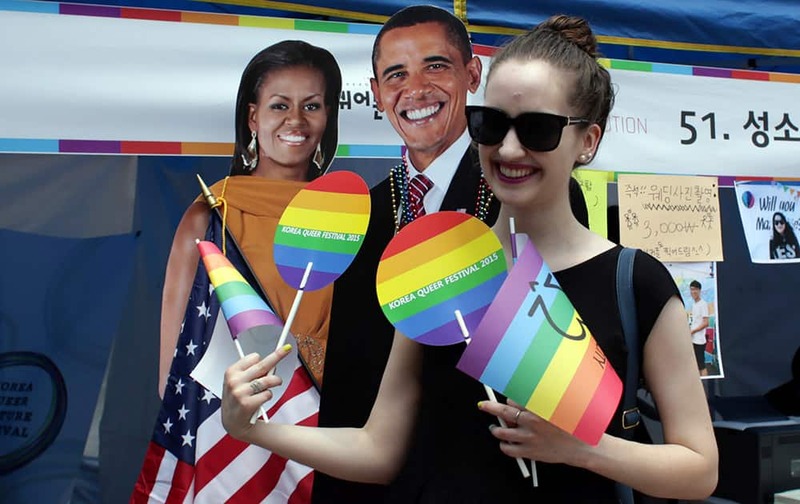 A participant poses for a souvenir photo with cutouts of U.S. President Barack Obama and first lady Michelle Obama during the Korea Queer Festival in Seoul, South Korea. 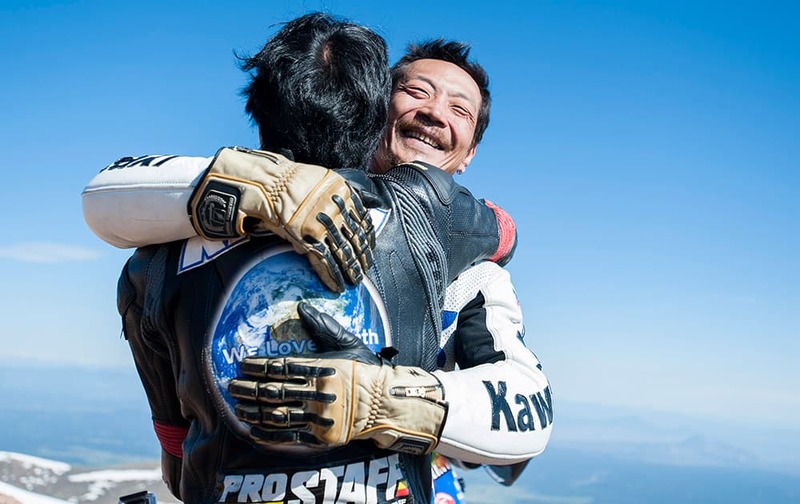 Yoshi Kishimoto, facing camera, is hugged by his friend Yasuo Arai after recording the fastest time for electric-modified motorcycles on top of Pikes Peak during The Broadmoor Pikes Peak International Hill Climb Sunday, June 28 in Cascade, Colo, 2015. 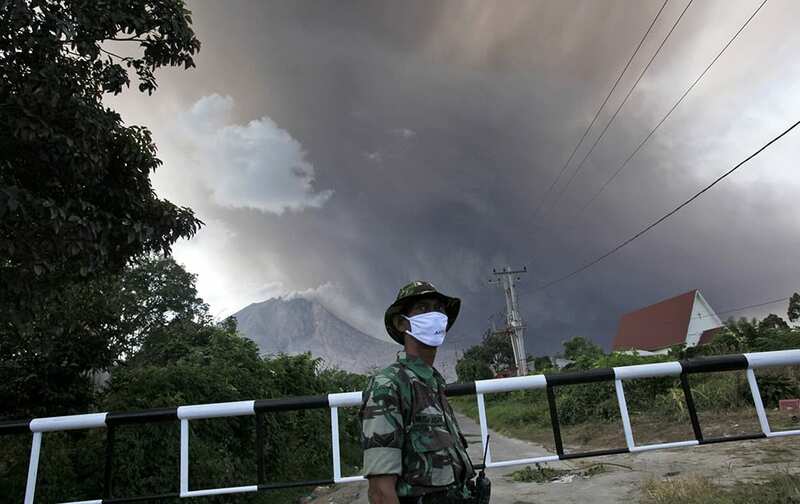 An Indonesian soldier mans a check point on a road leading to the area marked as danger zone on the slopes of Mount Sinabung in Sibintun, North Sumatra, Indonesia. 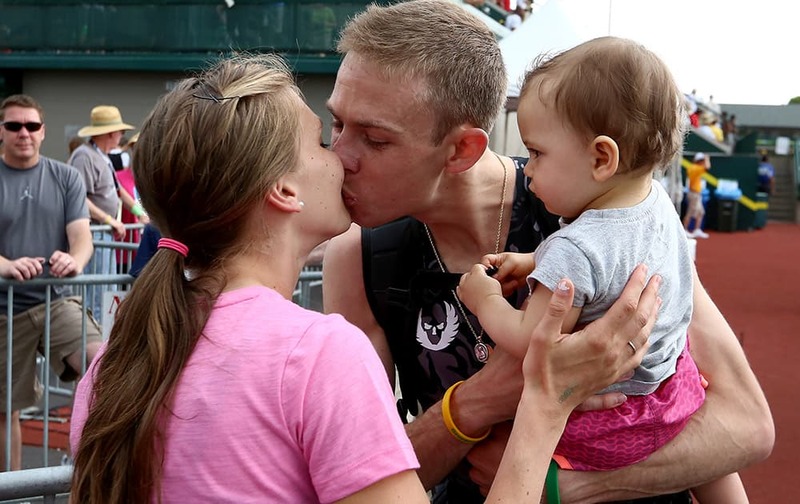 Galen Rupp, center, kisses his wife, Keara Rupp, while holding daughter Emmie after finishing third in the 5000-meter at the U.S. track and field championships in Eugene, Ore.
Turkish police use a water canon to disperse participants of a Gay Pride event in support of Lesbian, Gay, Bisexual and Transsexual (LGBT) rights in Istanbul, Turkey. 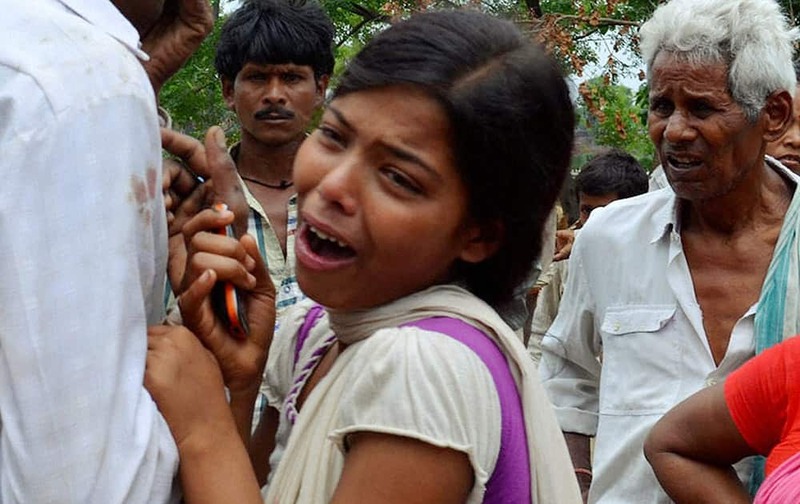 Wailing family members after two students of a residential public school were found dead, in Nirpur village at Nalanda district. 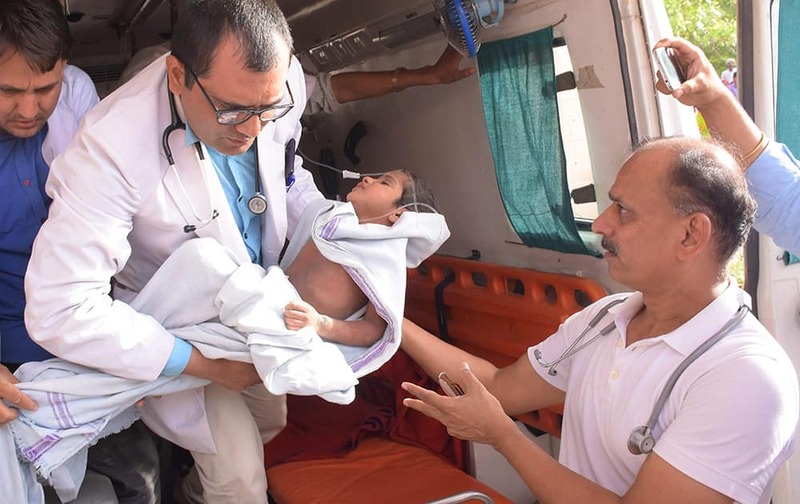 A seven-year-old girl being taken to a hospital in Jaipur on Sunday, who fell into a 50-feet deep borewell was rescued after being entrapped for 30 hours, at Ajeetgarh in Sikar district in Rajasthan. 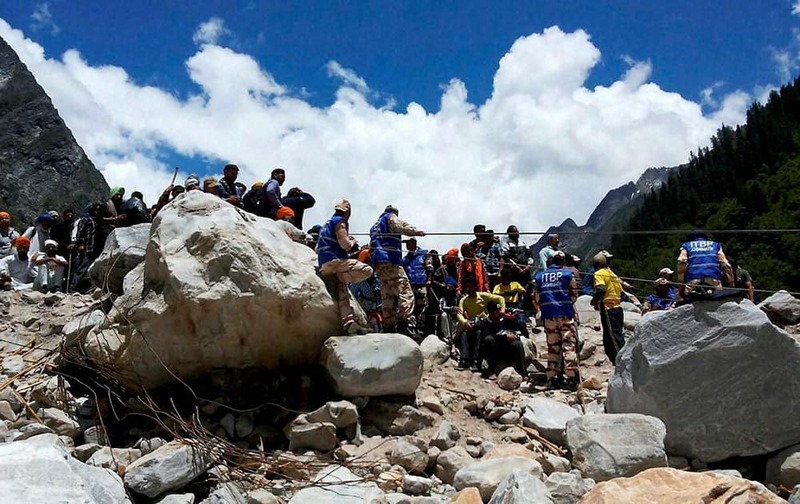 Rescue and evacuation operation for pilgrims carried out by Indo Tibetan Border Police (ITBP) and SDRF in Bhyundar valley near Hemkund Sahib. 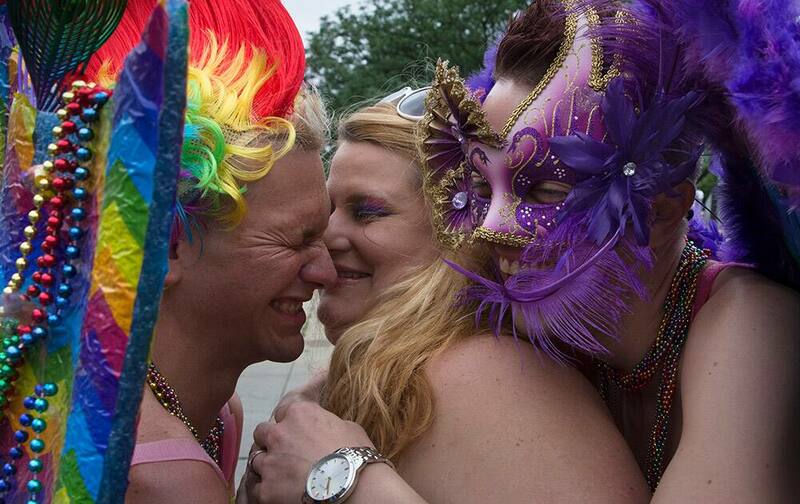 Revelers hug before stepping off during the Cincinnati Pride parade. 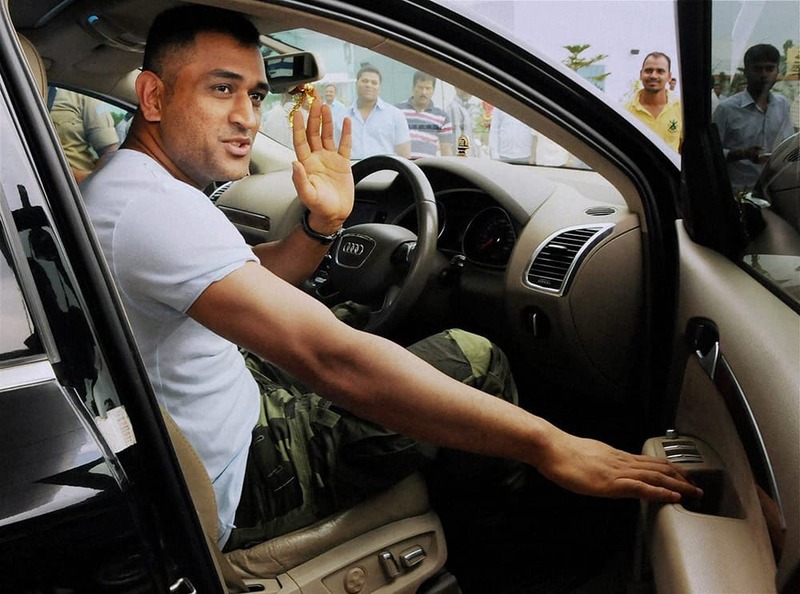 Indian Cricket team Captain Mahendra Singh Dhoni arrives at Birsa Munda International Airport in Ranchi. 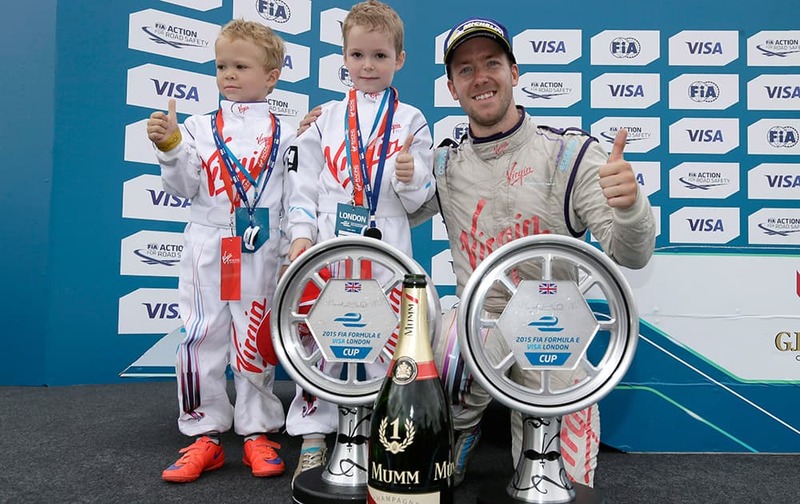 Race winner Britains Sam Bird, driving for Virgin Racing, celebrates with the trophy and his sons, Zak and Flynn, after the Formula E London ePrix auto race in Battersea Park, London.